The author, Sue Newman, has written other books on the history of the ancient town of Christchurch and its inhabitants and therefore has a good understanding of the past lives of those who lived in that area. The book is a detailed study of poverty and survival and of a bygone trade in Christchurch which evolved the fusee chain industry, an industry unknown to many people even today. 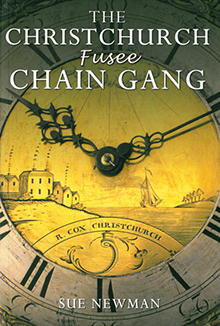 Christchurch may not have been the birth place of the fusee chain but it has been referred to as the nursery of the development of the reduction in the size of time pieces. There are 256 pages in the book that are packed with relevant information including colour photographs and maps, line drawings, census maps of the 19th century as well as a wealth of black and white photographs of tools of the industry and parts of time pieces. If you need information on the effect of the fusee industry in Christchurch and on its inhabitants between 1700 and 1900AD this will almost certainly be the most informative book on the subject. A well-illustrated book with seven chapters, appendix, bibliography and index.